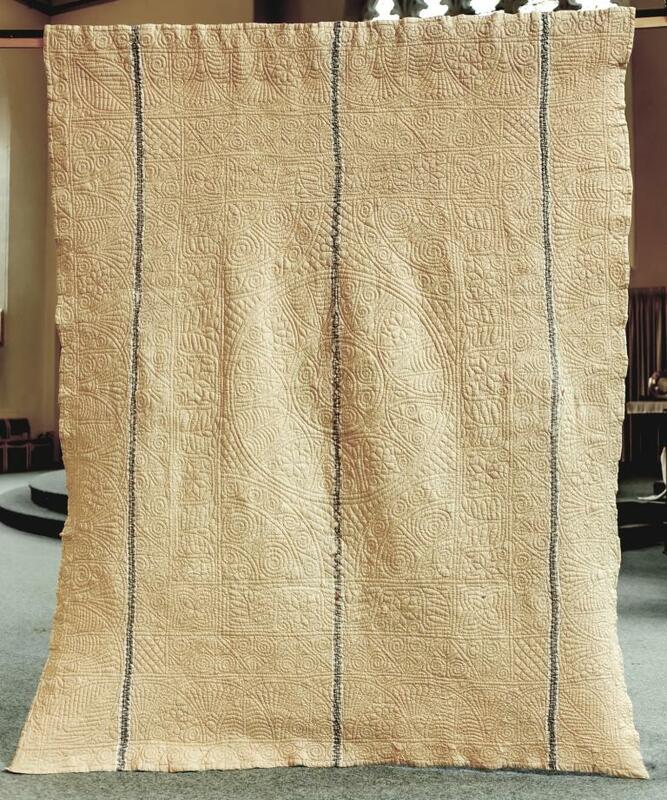 This intricately stitched Welsh wholecloth has a centre panel and four borders. 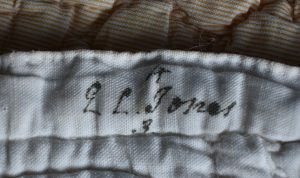 It has a signature on the back, which says Q L Jones – it took some while to identify the first letter, but apparently this is how it is written in the cursive alphabet. I don’t know what the numbers above and below the signature represent! I bought the quilt (with another red flannel one by the same maker) from a lady who knows that they came from the family of her Pembrokeshire father-in-law’s first wife, but it has not been possible to track down exactly who Q. L. Jones was – although it seems a strong possibility that she was called Queenie, as this was a very popular name in Victorian times, for obvious reasons! 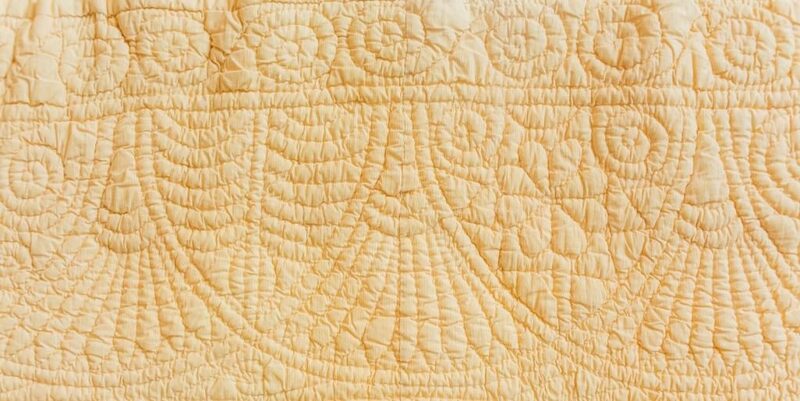 The top of the quilt is made from three widths of cotton fabric, each of which is 28″ wide. 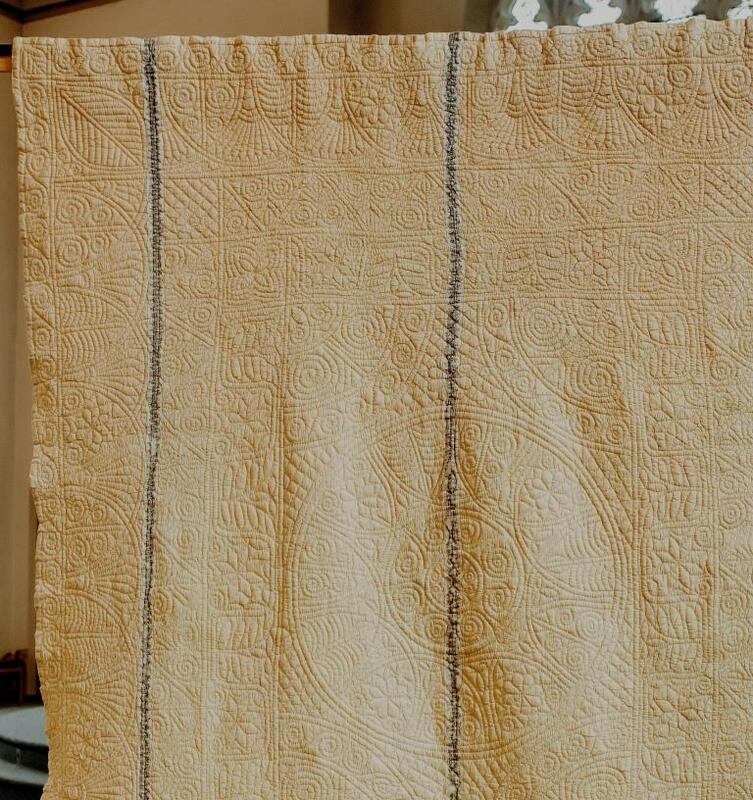 This fabric is actually a very fine yellow and white stripe (although this can only be seen in a close-up) and has an unusual feature design stripe running down the centre of each fabric width – this is part of the printing, and is not pieced in. It seems an odd choice for a quilt, but may help me date it more closely. The backing fabric is a plain white cotton, and the wadding is clearly sheep’s fleece which is bearding through in places. Through repeated washing, this has shrunk a little, giving a highly textured surface. 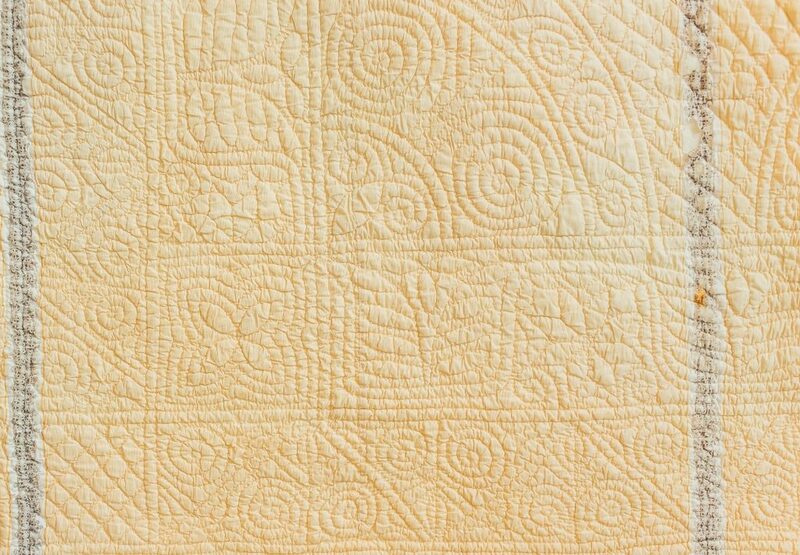 The quilting is hand-stitched in a white thread. There is a tiny set of eight spirals at the centre, and then another ring of eight larger spirals – these are a very typical Welsh motif. Then there is a ring of three different motifs within arches known as “church windows”. If you look carefully at the sequence, you will see that it repeats: spirals, flower, beehive…. with one exception. 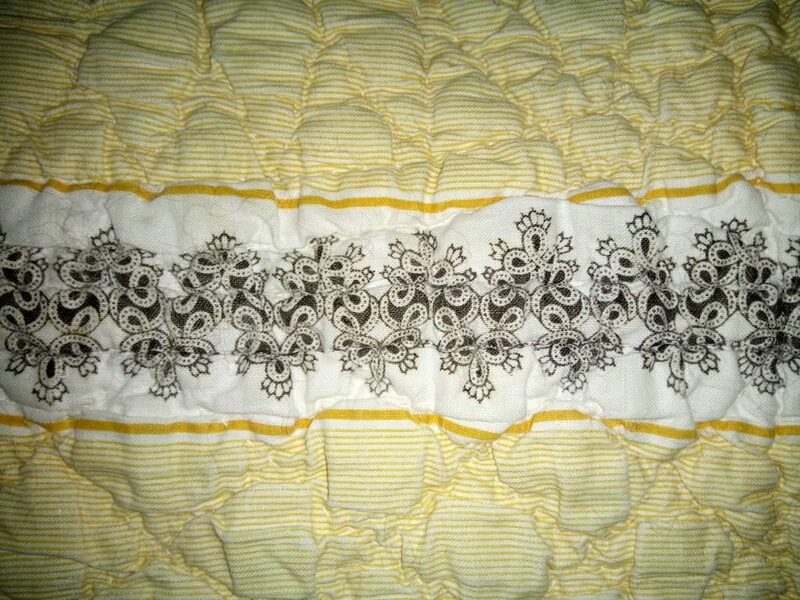 The quilter was only able to fit in eleven motifs around her ring, rather than the twelve which would allow four complete repeats. Can you work out which one is missing? The central area is extended to a rectangle with a fan at each of the four corners. 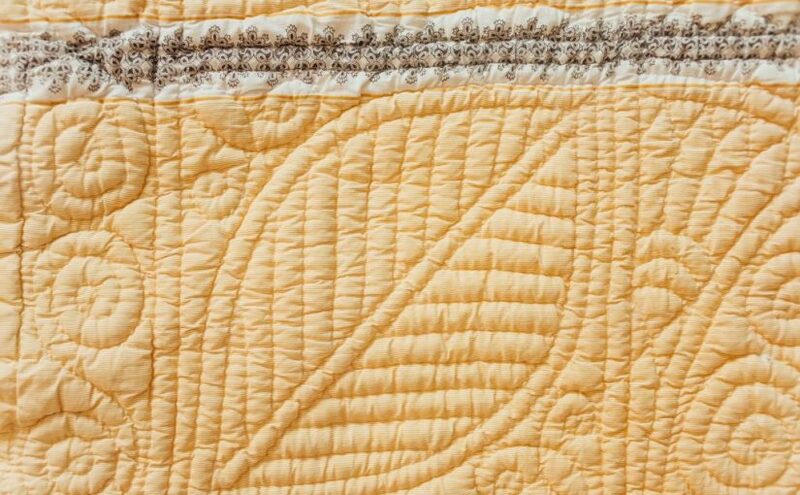 As is typical for Welsh quilts, there is a sequence of borders, separated by double lines. 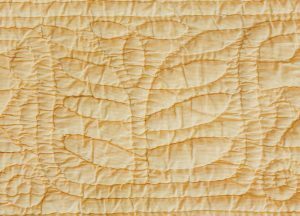 The use of a different motif within a lined square at the corner is a very common feature, as it avoids the need to make the border design turn the corner – here we see an echo quilted flower, a diagonal grid and a beech leaf. The first border has a rather square vine-like motif dividing the border into units which contain alternating motifs; a flower and a leaf. Look carefully at these two motifs in the first border of the larger picture above. The borders to the right and the left both finish nicely with a leaf motif and a vine strand. The border across the top however is not positioned quite so evenly – the left hand end has a vine strand next to the pointed flower, but there is no room to do this at the right hand end. 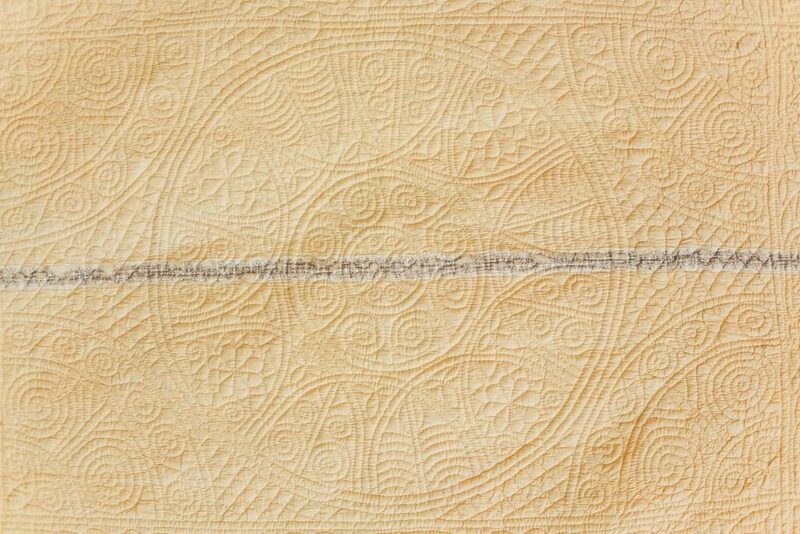 This Welsh quilter would have marked the quilt in the frame. 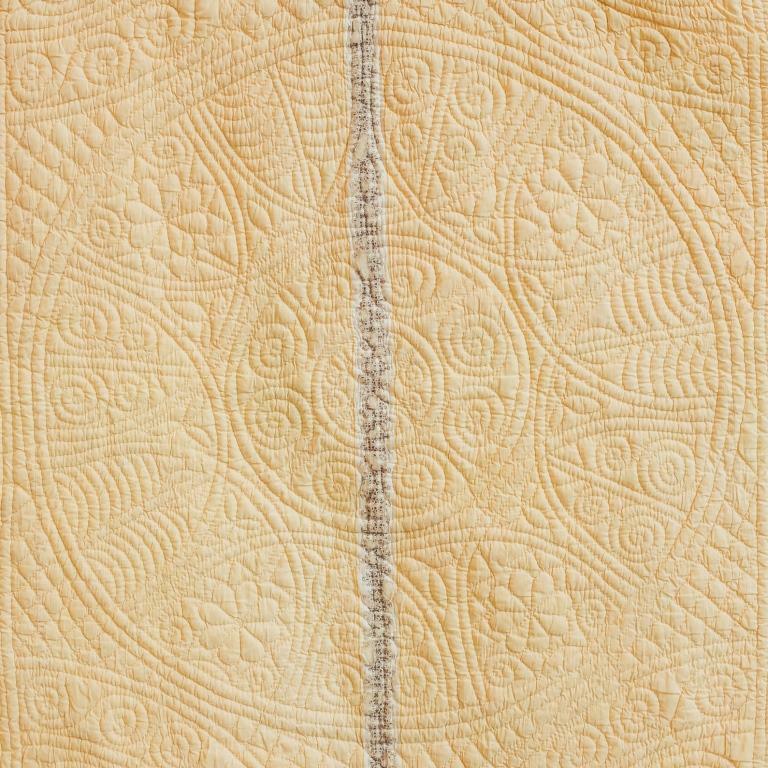 A standard sized template, was laid down at one end of the border and marked round before being moved, and the marking repeated along the border until the other corner was reached. 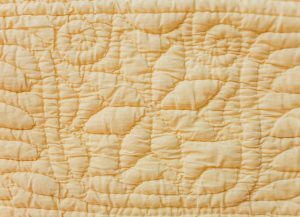 It is thus possible to work out which way round the quilt was stitched. 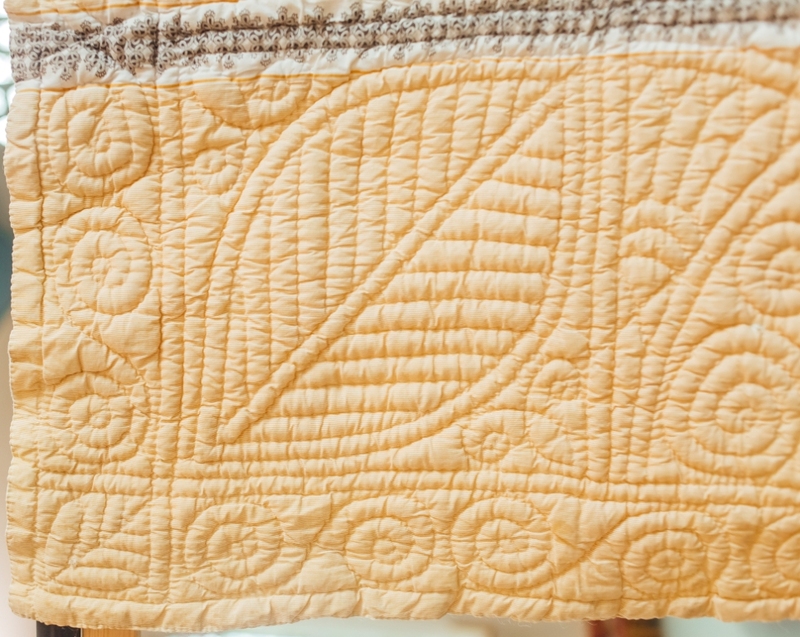 What we see as the top of the quilt would have been the first part to be stitched. She would have sat facing the centre, with the full width across her, but only a small portion of the length. When marking this border, if (as is more likely) she was right handed, she would have laid down the template on her right side first (we see this on the photo as top left), marked around it, moved it along, marked again, repeating this until she got to the other side, where she could only fit in the flower. She was able to mark the end portion of the side borders evenly, going away from her, but as she worked her way up the quilt, the two end up slightly out of phase by the time she reaches the other end – she manages to fit in an almost complete flower on our right, but its more squashed on the left. Look at the other borders – the same effect is apparent with careful study. 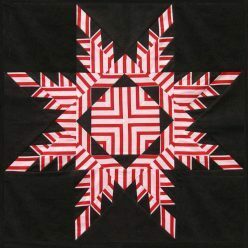 The second border has a dividing framework of zigzag chevrons filled with spirals. The third, most impressive border uses the same designs found in the central design. 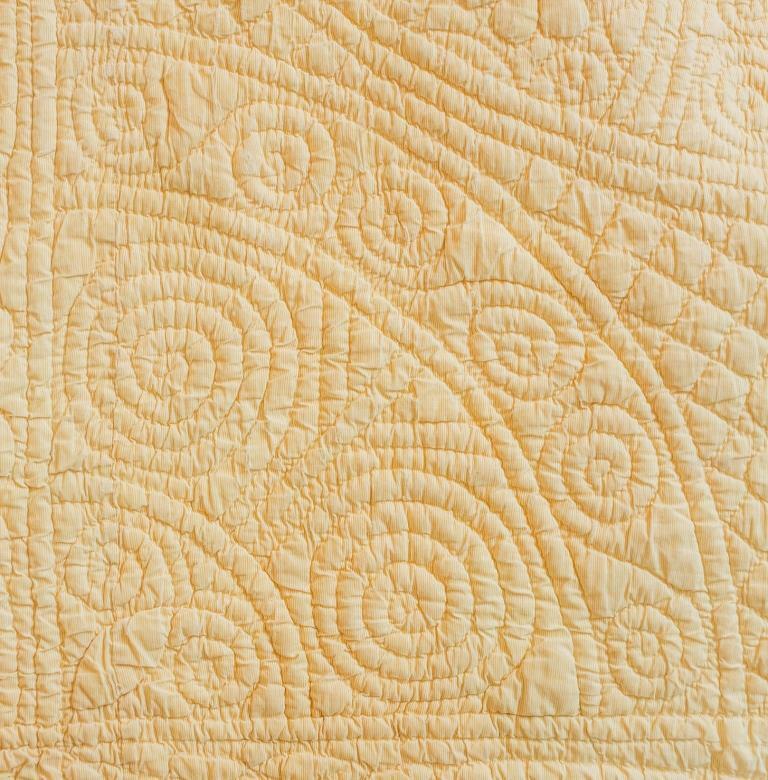 Again, the filling pattern alternates between the spiral, flower and beehive designs. More information about this research, and an opportunity to download the article, is available if you click here.